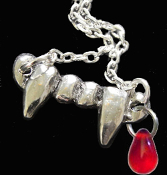 Silvertone Pewter Fangs Charm Necklace. 18-inch (45cm) long neck chain metal pendant necklace with safety clasp makes perfect jewelry accessory for any aspiring vampire! Add this fun costume jewelry accessory to your Originals, Legacies, Supernatural, True Blood, Vampire Diaries, Twilight party favor for all undead fans to wear. Halloween Dracula Vampire Gothic Pendant Necklace with Dangle 3/8-inch (10mm) Czech Glass Ruby Red Blood Drop Charm Bead. - True Blood, Supernatural, Legacies, Originals, Twilight, Vampire Diaries, Buffy the Vampire Slayer cosplay character inspired.